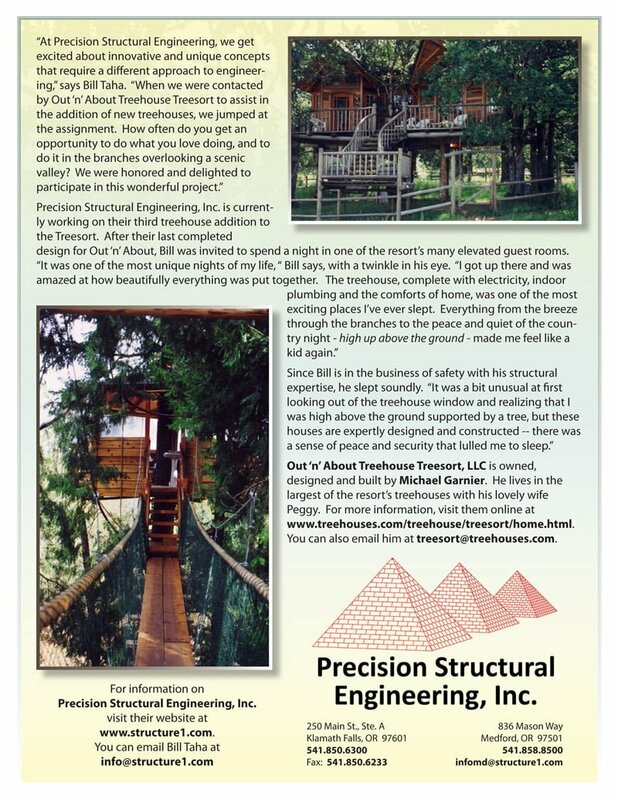 When Precision Structural Engineering, Inc. was approached with an opportunity to provide structural engineering design plans for several new treehouse additions for Out ‘n’ About Treehouse Treesort in Takilma, Oregon, the firm’s President & Lead Engineer, Nabil “Bill” Taha, Ph.D., PE, jumped at the assignment. 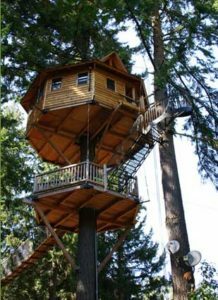 Nestled in a picturesque valley in Takilma, Oregon, near the headwaters of the East Fork Illinois River, Out ‘n’ About Treehouse Treesort offers one of the most unique lodging and educational resorts in the United States. Comprised of eighteen treehouses, a host of platforms (some as high up as 47 feet), some child-sized forts, swinging bridges and ziplines, Out ‘n’ About Treesort offers a perfect blend of scenic and natural beauty, combined with a childlike bit of magic and a rustle of adventure. This one-of-a-kind destination is also home to the Treehouse Institute of Takilma, a high school built into the branches of stately natural supports in this tranquil oak grove. Precision Structural Engineering, Inc. worked closely with Out ‘n’ About’s Owner/Designer/Builder, Michael Garnier, to create structural plans that perfectly complimented his innovative vision. 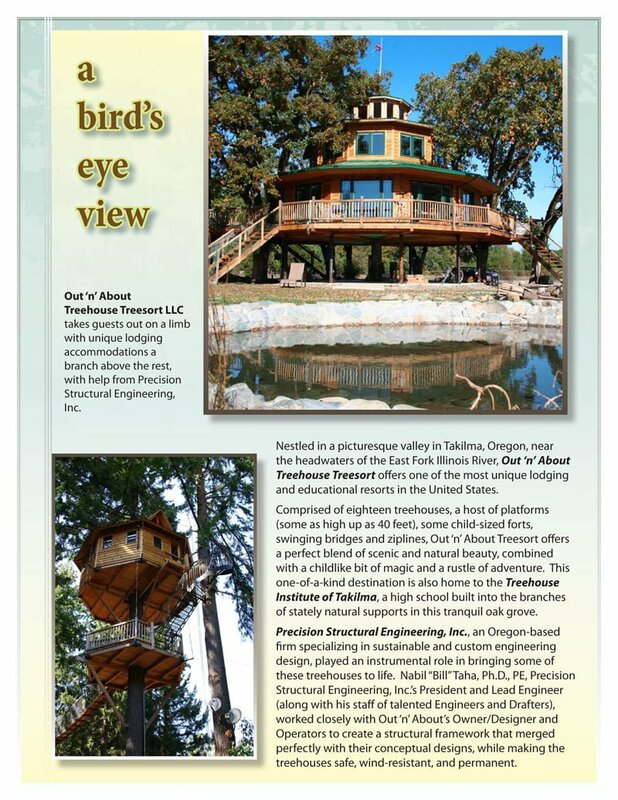 As part of this integral team, Precision Structural Engineering, Inc. ensured the treehouses conformed to all safety standards as well as wind and weight loads, making these elevated guest accommodations permanent fixtures that will withstand the affects of time, the elements, and frequent use by guests and their families.